Freedom and Flourishing: Is there an issue of respect involved in climbing Uluru? Is there an issue of respect involved in climbing Uluru? When I visited Uluru for the first time about 10 days ago I learned a little about its significance to the Anangu (western desert people) who are the traditional owners. A few days later, while we were driving home to New South Wales, the board of management of the Uluru - Kata Tjuta National Park released a draft management plan for 2009-2019 which raises, among other things, the question of whether visitors should continue to be allowed to climb the rock. The board was seeking comments from the public. Before we got home, however, Kevin Rudd, Australia’s prime minister, had weighed in with the view that it would be “sad” if people were banned from climbing the rock. While citizen Rudd is entitled to express his views on anything and everything (as he does incessantly) I think it will be sad if his intervention closes off further discussion of this issue. The significance of Uluru to Anangu is reasonably clear. They believe that as direct descendants of the ancestral beings who created the landscape at the beginning of time they are responsible for its protection and appropriate management. They also believe that they have a responsibility to safeguard visitors to their land. The main reason that traditional owners have given to discourage visitors from climbing the rock is the danger involved: “We feel great sadness when a person dies or is hurt on our land”. The draft management plan suggests, however, that an issue of respect may also be involved. It quotes Tony Tjamiwa: “That rock is really important and sacred. You shouldn’t climb it! Climbing is not a proper tradition for this place” (p 86). What is the significance of Uluru to visitors? Some of the literature about it suggests that it has something to do with the size of the object – it is 9.4 kilometres in circumference and rises about 340 metres above the surrounding plain. 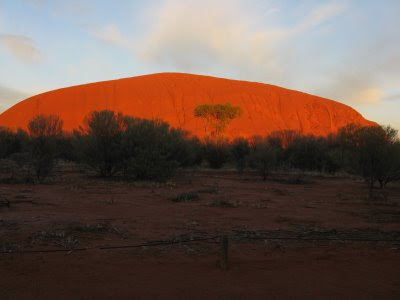 That might seem big to those who think of rocks as large stones, but Uluru is actually a remnant of an ancient mountain. It is composed of sedimentary rock that has become heavily eroded over time. Uluru is a natural object of great beauty. The explorer Ernest Giles described it as “ancient and sublime”. Giles, however, was not the first European to visit the rock. William Gosse got there first, in 1873, and named it Ayers Rock, after Henry Ayers (a South Australian politician who is most remembered these days for having had Uluru named after him). Tourists have been interested in travelling to Uluru for over 60 years, with the first vehicular track being constructed in 1948 in response to this interest. In the early 1950s several motels and a camping ground were built at the base of Uluru. Increasing tourism resulted, in 1958, in the area that is now the Uluru – Kata Tjuta national park being excised from an aboriginal reserve. Traditional ownership of the park was recognized in 1985 under an agreement in which it was leased back to the federal government for 99 years. Most visitors to Uluru presumably go there primarily in order to see Australia’s most recognisable natural icon first hand. Although climbing the rock has become something of a tradition, only about one-third of visitors now choose to climb. I imagine that fewer people would climb if it was made clear in the literature distributed to visitors that an issue of respect may be involved as well as concerns about safety. It seems to me that this is the crux of the issue. Is there a way that it would be possible for visitors to be permitted to climb the rock that would be consistent with appropriate respect for this place? i believe respect is in order but the rock would be lonely if no one were allowed to climb upon her. Things like this were created to have purpose and having respectful beings climb this great rock is certainly one of them. What's the use of those rocks if no one would climb them?